I’ve inherited an ever-increasing number of family history materials, and have been working for a while at determining the best way to care for each of them. The one whose care I consider particularly urgent is a specific scrapbook I inherited. Some loose items in the scrapbook, shown with some of the wide variety of still-pasted items. On the left, the paste residue gives a rough idea of how many items have fallen off that page and are now loose. On the right, the backs of a couple of the now-loose items are shown with their paste residue. 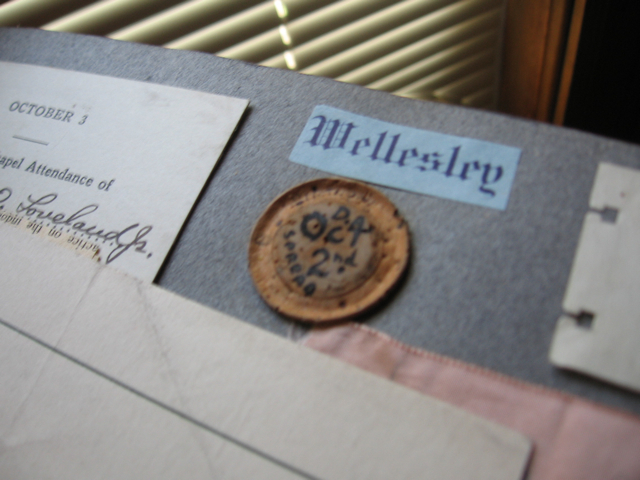 Some more of the wide variety of items in the scrapbook are shown, including a raised item in the lower right. Another page with a variety of items in the scrapbook, including a raised item shown in the center of the photo. The scrapbook’s leather cover is, surprisingly, in excellent condition despite being nearly a century old. I’ve attended a number of events and lectures on ways to care for family history items, and am looking forward to attending a couple more in the upcoming months. In April I attended an event on preservation and conservation at New England Historic Genealogical Society (NEHGS). It was the day after New England Regional Genealogical Conference (NERGC) 2013 ended [I wrote three blog posts this spring on my time at NERGC for anyone who’s interested but hasn’t read them], and luckily I did not fully realize this when I signed up, as I probably wouldn’t have gone if I had. The event featured lectures on a variety of preservation and conservation topics from staff at NEHGS and the Northeast Document Conservation Center (NEDCC), and after the lectures ended, attendees had the opportunity to consult with experts from NEHGS and NEDCC on specific items. 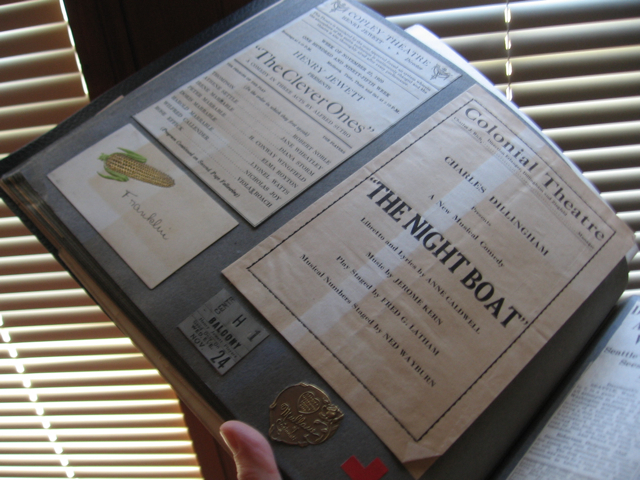 In my years going to NEHGS, I had become acquainted with their head conservationist, and I showed her some photos of my poor-shape scrapbook and asked her advice. She happened to have a scrapbook with her that had originally had several of the same issues as mine but had been conserved by an archivist from the same archival school that the conservationist had attended, so she was able to physically show me one approach to conserving a scrapbook. The scrapbook had been moved from its original binding and a strip of 4-ply museum board had been attached to the inner edge of each page. For pages that had items attached which protruded (as my scrapbook has as well), two strips of 4-ply museum board had been attached to cushion the object from potentially damaging other pages and/or the binding. 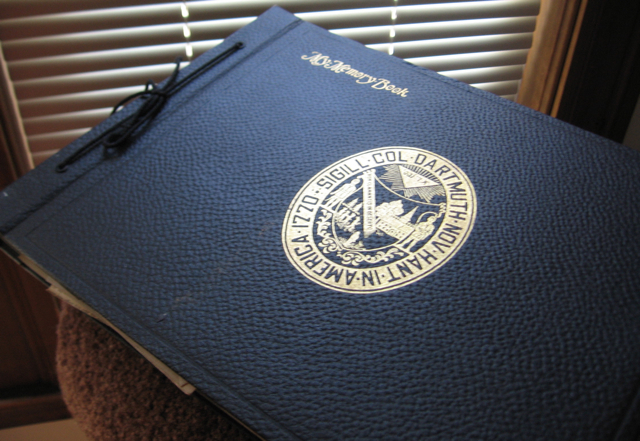 Archival plastic was between each page for protection. 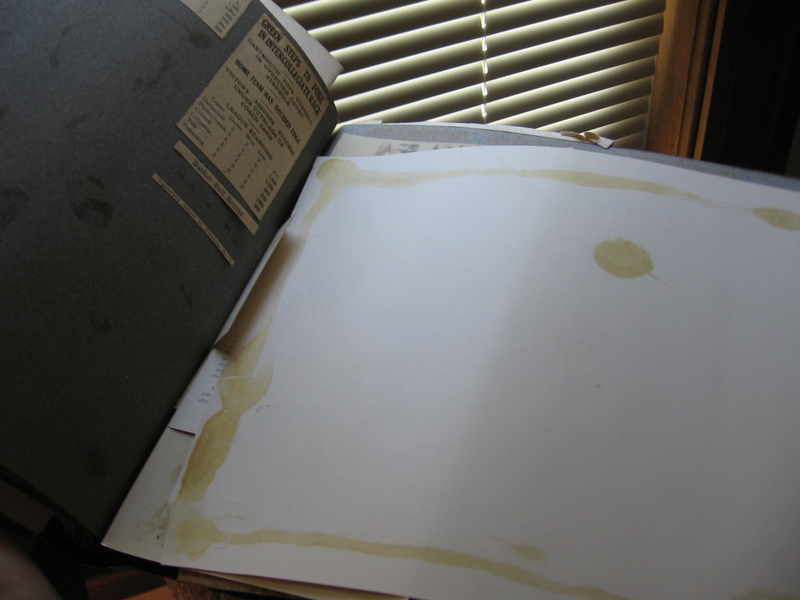 While she wasn’t 100% sure since she hadn’t done the work herself, she believed the screws the archivist had used to bind the restored scrapbook together were likely aluminum so that they wouldn’t rust. I meant to finish and post this shortly after the event, but it has been nearly three months now and I have attended another pertinent event in the intervening time. Cambridge Historical Society [of Massachusetts] holds Open Archives Tours every summer, and this was my second year attending. For the first time, this year they held an “Ask the Experts” open house the last day of the tours, where people could bring in an archival item and ask one of the archivists in attendance for advice on conserving and/or preserving it. I brought my photos of the scrapbook along again. The paper expert was busy the whole hour-plus I was there with an older woman who had brought an entire box of materials she’d inherited along, but I didn’t mind; I asked another archivist, the one from Cambridge’s Department of Public Works, his opinion on my scrapbook. He noticed right away that the binding is a tie, and suggested undoing it and putting each page in an archival sleeve. The previous expert I’d consulted about the scrapbook had suggested putting the fallen-out items back into their original places, but this expert suggested I might want to use a professional archival item that removes the paste from the fallen-out items instead, so that they would not potentially be able to damage any items that remain pasted in the scrapbook, and then keep the fallen-out items in the same archival sleeve as the page from which they fell. This archivist was very interested in the content of the scrapbook, studying the items the viewer can see in the photographs, so I told him some about the scrapbook and the family that produced it. I follow the basic rule of the first conservation expert whose workshop I attended: I don’t want to remove the items from the scrapbook entirely as that would destroy the coherency of an artifact that was made by someone who is no longer alive to reassemble it, destroying its uniqueness as an object. You may have noted that both the suggestions, while not exactly the same in the details, also followed this principle. Neither of the experts asked me whether I had a preference for doing the conservation myself or having a trained professional do it, nor whether I would be able to pay someone else to do the work. Their suggestions are fairly similar, but the first suggestion deals directly with one more issue than the second one – what to do about the pages that have raised items on them. 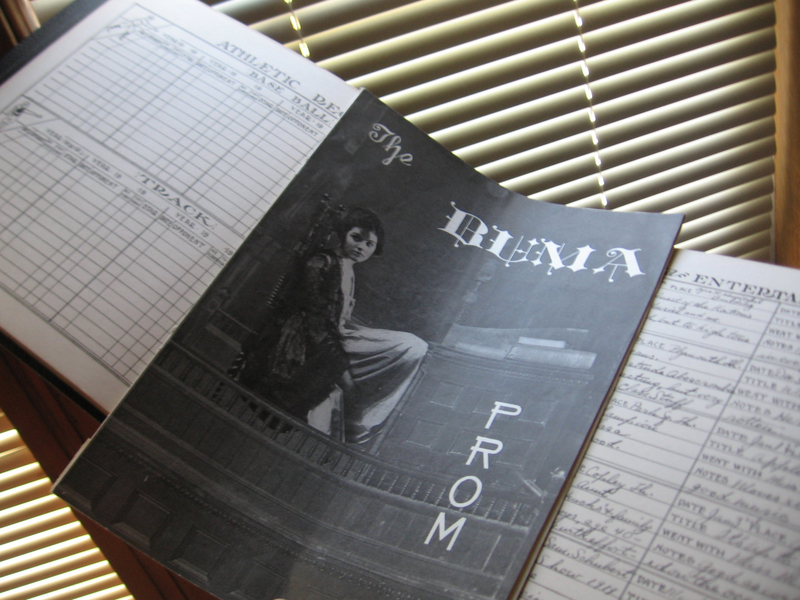 As of this posting, I have yet to decide what to do about the scrapbook, though I know that time is of the essence. A huge note of caution: At the NEHGS event, I learned that a product sold as “acid-free” in the United States only means that the product was completely free of acid at the moment it was produced. It does not mean it will continue to be acid-free and in many cases, these products degrade to the point where they are emitting acid, sometimes rather quickly. The best way to obtain products that continue to remain acid-free is to buy archival-quality products from a reputable archival company that professionals also use. As someone who has read a number of books about caring for family history archives, the one I’ve found the most helpful so far is Help! I’ve Inherited an Attic Full of History by Althea Douglass. A number of new books have come out in the past few years, including books by Denise Levenick (@FamilyCurator) of the blog The Family Curator and Melissa Mannon (@archivesinfo) of the site ArchivesInfo, but I have yet to read any of them. Overall I recommend reading books, attending workshops/lectures, etc., from a variety of experts, because as my experiences in this post illustrate, opinions vary a little to a lot on how to deal with both general care and specific issues. There has been much to-do recently in the genealogical community over Ancestry.com’s decision to do away with what they call “old search,” the search system they used to use. Ancestry’s claim that only 2% of users utilize old search today may have been the most incensing comment. In talking with a number of experienced genealogists locally, I have determined via self-reporting that most of them gave up on old search mostly or totally because they found it really difficult to keep track of how to find it on Ancestry, since the link kept being moved on the site; a number of them weren’t even sure how to reach it now. As a genealogist and historian, when it comes to websites and other archives, I am interested in practical results: How easy is it to find what I want, even if I’m unaware that it’s what I want when I start? If it’s not easy, is it worth the trouble to locate it? And is there something there that I’d be unlikely or impossible to ever find due to something to do with the site/repository/etc. rather than due to my own research methods? Recently I have been researching someone named Zenas Clement. This name appears to have been unique in Ancestry’s 19th century U.S. records, so Zenas seems to be a good test case. I have used a variety of strategies with both old and new search to test the results. When I started researching him, I started out working backwards from cemetery records, so I knew his death date and place and approximate age, and that he was quite likely related to the people with the same surname in the same cemetery plot. The typed cemetery records spelled his name “Zenos,” which seems to come from an understandable, though apparently inaccurate, reading of the handwritten “Zenas,” which really does look like the “a” could be an “o.” It didn’t take long to determine that he was the husband and father of some of the other people buried in the plot. The nag notice Ancestry now frequently puts up when you’re searching and get few to no hits that it considers to be good ones has annoyed me since they introduced it, as in my opinion it quite erroneously implies that the more information you put into a database, the more likely you are to obtain results that are “your person.” In reality, putting in a lot of information can trick a database into missing relevant results because the hits aren’t a good match for the large amount of information you entered. My test case with Zenas illustrated this well. When I included Zenas’s approximate birth date, death date and location, wife, children, and known residences – which new search defaults to doing if you hit “Search” from a profile page in an Ancestry tree – some of the top hits were for people who happened to have the surname Clement and matched one or two of my other parameters. For example, I got an 1880 U.S. federal census result for Moses Clement, who had a wife Sarah H. Clement (not Zenas’s wife’s name) and a daughter Sarah J. (Zenas had a daughter named Sally J. ), who was born approximately five years later than Zenas, in a state that neighbors the state Zenas was born in, and lived in a state (though not a county, much less a town) where Zenas had lived prior to 1880. I get another top hit on the 1880 U.S. federal census for a David Clement. It takes less than the first page of results to reach the blue box where Ancestry says that results below the box are much less likely to be “your ancestor” (apparently Ancestry assumes no one will be researching anyone but their direct lines). A number of the top hits below the box are for a Zenas Clement, so I have absolutely no idea why two people with the wrong name are above the blue box while some exact matches on the name are below it. But some of the other below-the-blue-box results on the first screen of hits are completely inexplicable to me. For example, one is a web-results hit for a mention of a Montagna Michael Clement in an offsite North Carolina birth index; Montagna appears to be the parent of the infant, which at least explains why I got a result for an index that doesn’t start till 1865 (64 years after Zenas’s estimated birth), but literally the only reason this seems to turn up is because the father and mother have the same surnames as Zenas’s surname and his wife’s maiden surname. They don’t have a child with the name of the child in the index result, and I gave the database nothing to suggest they ever lived in North Carolina. The second page of results returns one exact match for Zenas Clement’s name and a ton more irrelevant hits that happen to have the surname Clement. The next few pages similarly contain mostly people that happen to have the same surname, as well as a few hits where the first name is Clement and a couple hits where there are no name matches and it is not apparent why they are coming up. There are no matches for Zenas. By the 6th page of results there are still no more matches for Zenas, and the number of “no apparent reason why this hit is coming up” have started to increase. All in all, inputting as much as I know and can input into Ancestry’s new search turns up 15 results for Zenas in the first 6 pages, 9 of which are above the blue box, and 14 of which are on the first page. I suspect after 4 full pages with no so-much-as-plausible results at all, most searchers would simply move on to a new search (be it a different search for Zenas or a search for a different person). A little more information will give you better results. Try adding a state, province or country in “Lived In (Residence)” Try adding a birth or death date; even a guess might help. You can press ‘r’ to refine your search, or ‘n’ to start a new one. Check out Getting the most out of new search for more tips and tricks. This is particularly annoying to me, not only because I did include a birth date (I’ve sometimes gotten this nag box at the very top of my results even when I provided detailed information), but also because scrolling down past the nag screen I immediately see that this search, without providing detailed information, has given me much better search results than my previous search, including several items that are immediately obviously about Zenas but didn’t turn up in the entire first six pages of the other search! There is only one result on the first page that seems puzzling given what I inputted, but clicking through to read the user-submitted “story,” it turns out that Zenas is mentioned in the text of a story that has been attached to someone unrelated who happened to be living in the same town at the same time. There is only one result on the first page that doesn’t directly pertain to this Zenas Clement, but the results match what I have inputted – a Z. Clement, born in approximately 1800, enumerated in Louisiana on the 1860 U.S. federal slave schedule. Since I did not give any location where Zenas had lived, it is a perfectly reasonable result that matches the information I gave in my search. Clicking through to the second page of results, the upper hits on the page also match Zenas, and then there are a few Optimal Character Recognition (OCR) results where the word “Zenas” and the word “Clement” appear near each other on the page but aren’t actually a match – and then suddenly it drops to what happened on the very first page in the previous search – a whole heap of results for people who have the surname Clement but not the given name Zenas. The third through sixth pages consist completely of the latter type of result, and again, at that point I think most people would simply give up on a search (either on Zenas altogether or on their current search strategy). This search strategy returned 30 hits that matched Zenas Clement, all in the top 2 pages, and most of the non-relevant hits in the top 2 pages were understandable given the search parameters. Next up, I did the same low-info search on “old search,” which you can reach by going to the “Search All Records” option in the drop-down “Search” menu and then clicking on the tiny link to old search in the upper right of the page. The top 14 hits are all for Zenas Clement. Then they take a very different turn – by returning some Massachusetts results for a Zenas Coleman. There are 5 results for this Zenas Coleman, followed by the Z. Clement who was on the 1860 federal slave schedule in Louisiana. “Clement” to “Coleman” is not a big leap when recording from hearing, so I can understand why the “Coleman” results turned up, and if I were researching a name that was frequently misheard, I would likely be appreciative of the implication to consider searching for the surname Coleman as well. Page 2 immediately returns to hits for Zenas Clement, starting with some of the same hits that turned up in the low-information-inputted new search but were completely overlooked by the high-information-inputted new search. The first 12 are for Zenas Clement, and then the path follows a similar one as to the low-information new search – there are some OCR hits where the words “Zenas” and “Clement” are near each other, and then the hits for other people with the surname Clement begin. There are no more hits for any Zenas Clement through page 6 of results. Since a low-info old search defaults to not including “Stories & Publications,” that probably explains why the two newspaper results that did not turn up in the high-info-inputted new search but did turn up in the low-info-inputted new search are not turning up in old search. Indeed, clicking on the tab for “Stories & Publications” results, the member story that turned up in the low-info new search is the top hit, and the third and fourth hits are the same newspaper stories as in the low-info new search. There are also a good number of other hits for Zenas Clement in the first page; all but the two user-submitted stories list the name Zenas Clement in the results column. 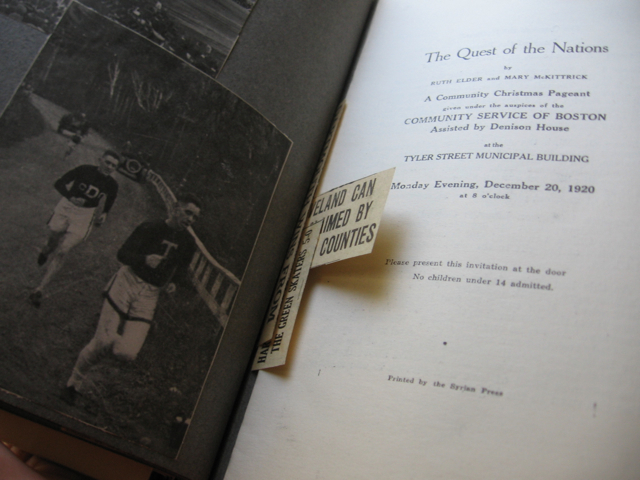 The “publications” in the results include a number of scanned local history books, and one includes an entry about Zenas’s wife’s family that provides her maiden name. Of course if someone found this in an initial search it would need to be backed up with other research, but for a researcher doing a skeleton sketch of the family as their starting point in research, it would provide a possible maiden name – as well as her (supposed) parents’ and siblings’ names and the names of her adult siblings’ spouses, her mother’s maiden name, and her mother’s second husband’s and parents’ names – as a significant starting point in their research. The first page of old-search “Stories & Publications” results provides 17 more results for “my” Zenas, as well as two OCR matches where Zenas and Clement are near each other, and one private member story for someone who lived in England in the 17th century (since I cannot see the private member story, I cannot tell whether the name Zenas Clement is in it, though with the significant time difference I am unclear on why it turned up as the second hit anyway). These hits provided a lot more color for Zenas’s biography than the hits that turned up in the “Historical Records” search on old search, and almost none of them turned up in the first six pages of results on new search – only 1 in the high-info new search, and only 3 in the low-info new search. Through them I discovered such things as that Zenas was on a temperance committee, was a member of the state legislature for at least one session, and was a member of a state militia. Of course these local histories need to be backed up, if possible, with further research, and cited as the only known source if one is unable to find further records supporting the claims, but they provide a starting point for knowing what other records to seek. The lowest relevant hit on the first page of “Stories & Publications” was to a fairly lengthy biography of Zenas’s son that mentioned Zenas as his father, and would allow the researcher who was working forward in time instead of backward to figure out where Zenas’s son had moved and what had happened to him. The second page of results in “Stories & Publications” is a mix of relevant and irrelevant hits, and it would behoove the intrepid research to look through all the hits on the second page and to keep going through further pages of results. The “Historical Records” section of the low-info old search yielded 26 results for Zenas Clement in the first six pages, and the “Stories & Publications” section of the low-info old search yielded 17 results for Zenas Clement on the first page and 3 more on the second page, after which I stopped searching for the time being due to having to click through to each page to view OCR results on old search. All in all, that’s a total of 46 relevant results in just 8 pages of results. Even given my fairly generous -/+ 5 years choice for the birth date in my search, 1810 is outside of this range, and while I included New Hampshire as one of his residences, I did not list it as his birth state. Any information is only as good as its source, and presuming this is the same Zenas Clement, whomever gave this information to the Boston Transcript provided both an incorrect birth year and an incorrect birth state. The next hit is – incredibly inexplicably to me – for the marriage of a William Brown to a Catherine Jennison in Massachusetts – except for Zenas’s wife Catharine’s given name (spelled differently), neither the names nor the location matches anything I inputted. The rest of the page is a mix of results for Zenas and irrelevant results, most of which only match a state of residence and/or a surname, and another of which doesn’t match anything I searched for. Page 2 provides the same mix of relevant and irrelevant results, and by page 3 I’m at the same point I was after inputting a lot in new search – people who have the surname Clement but are otherwise irrelevant. I even recognize a number of the same names/locations from the similar search in new search. To match the high-info new search, I scrolled through the rest of the first six pages; no further results for Zenas occurred. I got 17 relevant results, none of which included the newspapers or local histories that by now I knew Zenas was listed in on Ancestry. To do a high-information-inputted search in the old search, you have to switch to “Advanced Search,” which causes you to lose the ability to choose between tabs at the top of your search results, so I no longer got to switch from “Historical Records” results to “Stories & Publications” results. Using old search garnered more results early in my search results than using new search. Starting with a low-information-inputted search garnered more results early in my search results than immediately starting with inputting a lot of information, regardless of whether I was using old search or new search. As FamilySearch advises in their own dialogue boxes, if starting with a a low-information search returns too many irrelevant results, you can always start adding more information till you start getting pertinent ones. Note Heather Rojo has compiled a list of recent blog posts about old vs. new search on Ancestry, along with some older posts and articles on the subject, at “Flash Blog Mob” about Ancestry.